The 1970's through the 1980's were a trying time for many American families. Following the OPEC Oil embargo in the early 1970's, the cost-of-living skyrocketed, further aggravated by the Fed's monetary policies (mortgage rates at that time hit double-digits, ushering in a new product known as the adjustable rate mortgage ["ARM"] as consumers simply refused to be tied down for 30 years to rates that were the highest ever in U.S. history), and the job market was lousy (Note to the "Occupy" people: contrary to what you might believe, this is NOT a new phenomenon, catch the Gen X perspective on that HERE). A new term also became commonplace: stagflation, which was a combination of [economic] stagnation and inflation, both of which were occurring at the same time. Many families struggled to make (economic) ends meet. However, American families proved resilient in spite of government economic policies that, frankly, worked against so many. Their solution: dual-income families became the norm, rather than the exception as was the case in virtually all prior decades. Women entered the workforce en masse. 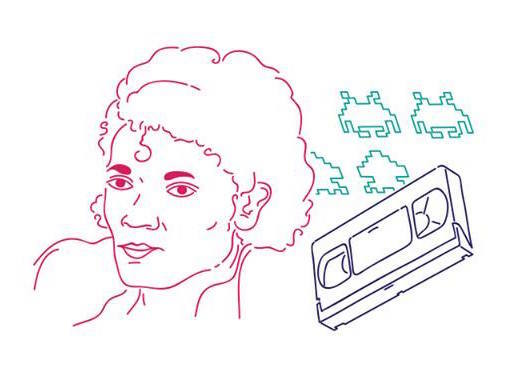 The stay-at-home mom became the anomaly, leading to Generation X to become the first true generation of latch-key kids. Much has been written about the impact working mothers' had on children, but the good news is that long-term research suggests that most members of Gen X are leading active, balanced and happy lives, according to a long-term University of Michigan survey (see HERE for the press release, catch the research report HERE, or listen to the podcast HERE). As for the impact of working mothers on family dining, on the other hand, was less positive. To be fair, women still shouldered more of the burden than fathers (of course, widespread divorce also became common, so single-family households were also pretty routine), and it showed up in what families were eating. The Slow Cooker (perhaps better known by the brand-name The Crock Pot®). Yes, It's Harvest Gold Color, Too! It certainly beat yet another variety of Tuna Casserole that could be cooked in 10 minutes, and this enabled working mothers to prepare a stew-like recipe ahead of time and be able to come home to a hot meal that had been cooking all day while they worked. These were especially big before microwaves became commonplace in the early 1980's. I can just see "One Day At A Time's" Ann Romano whipping up a Crock Pot recipe so her daughters wouldn't burn the apartment down while trying to cook (especially Julie, who at the time, was more likely to use the stove to cook methamphetamine than dinner)! In truth, slow cookers have their place in cooking, and they do pretty much what they promise. But let's face it: no one would likely call stuff cooked in Crock Pots high "cuisine". Virtually everything done in the slow cooker is a stew of sort, and that's not something I really want to eat every day. I'll take Mrs. Paul's Fish Sticks as an alternative once a week just for some variety! There was a temporary resurrection of slow cookers a few years ago, albeit temporary. 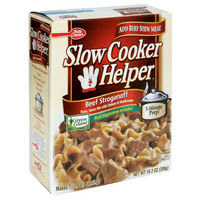 Even Betty Crocker got into the game with "Slow Cooker Helper", complete with dehydrated vegetables ... just add meat! But Slow Cooker Helper was a little too processed for most people, why not use REAL vegetables, especially since they're going to cook all day long!